Huechulafquen Lake Monster - "Huechulito"
This lake, is set at the foot of the Andes in southern Neuquén Province, Argentina. (39°46' S, 71°23' W). It is quite large, as it has a surface area of 104 km2 (40 sq. mi.). An extinct volcano, Mount Lanín (3,776 m - 12,380 ft.) high overlooks the lake. 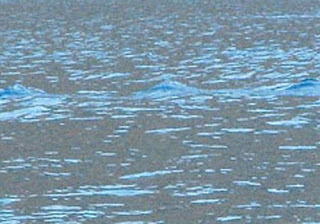 many times I heard respectable neighbors of Junín de los Andes say […] that in the Lake Huachi-Lauquen [sic], at dusk, an animal often appears on its surface, which has more or less the same features of the one that is said to have been seen in Esquel. Very long neck, lizard head, body that must be enormous, because when it submerges it produces a sort of “boiling” in the waters. Recently, a tourist named Jorge Salcedo while on an excursion in a catamaran in March 2009, photographed what looks like a set of three waves that look more like the wake of some boat than the back of an animal swimming just below the surface. This site has all the photographs, a comment by Mr. Salcedo and the location of the sighting on a map. 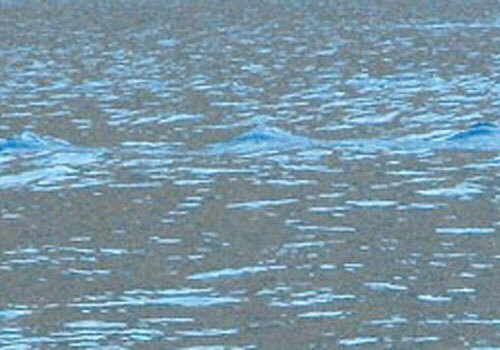 The media quickly reported it as a lake creature, and named it “Huechulito”. And the locals recalled that “about 20 years ago some border patrol officers shot at a gigantic reptile that got into the lake and managed to escape”. You can also see my post on the "cow" at Lake Huechulafquen. A plausible explanation could involve otters or even gas bubbles surfacing in the lake (there is plenty of geothermal activity and hot water springs in the area). The reptile resemblance makes it similar to the creature reported in the Bio Bio River in 1914. This "reptile" was sighted at this Chilean River by the town of Santa Bárbara (37°39’ S, 72°01’ W). The creature was described as a “reptile or similar animal”. Its lair was on an inaccessible cliff by the river. This “kind of lizard, enormously thick, three or more meters long, of a light gray color” left a track “close to a meter wide and similar to that of a snake dragging itself”. It hunted sheep and calves. It also resembles the "Culebrón" myth of the Mapuche natives, which we will write about in another entry. El Dia La Plata. 20.05.2009. Monstruo del Huechulaufquen: ¿mito o pura realidad? Diario Uno. Mendoza. 21.5.2009. Crece el mito del Huechulito. Gröthe, S. Reptil en el Rio Bio Bio – 1914. Bestiario de lo cotidiano y extraordinario. (14.11.2008) Citing: La Prensa. Curicó, Chile. 28.03.1914. pp. 4.